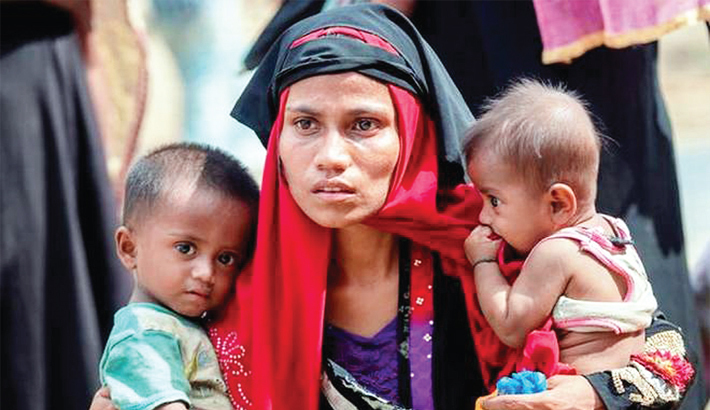 State Minister for Foreign Affairs M Shahriar Alam has said the international community has a shared responsibility to help restore the Rohingyas' fundamental rights and freedoms, including their right to return to Myanmar in safety and dignity, reports UNB. "By opening our borders to the persecuted Rohingya, Bangladesh has not only saved lives but also stabilized the entire region," he saidat an OIC meeting on Thursday. He raised the possibility of creating a civilian "safe zone" for the returnee Rohingyas in Myanmar, to be monitored by the human rights and humanitarian outfits in the concerned regional context. While briefing OIC Ambassadors and delegates about the evolving situation with the crisis, State Minister Alam sought OIC Member States' support for creating a conducive situation in Myanmar for the Rohingyas' safe and dignified return. The State Minister also shared information on the government's plans to relocate a portion of the Rohingya population in Cox's Bazar to the Bhashan Char island in consultation with all concerned stakeholders. The OIC Member States reiterated their commitment to help find a peaceful and lasting solution to the crisis through sustained engagement in the relevant human rights and humanitarian fora in Geneva, aaccording to the Ministry of Foreign Affairs here. State Minister Alam also had a bilateral meeting with Michelle Bachelet, UN High Commissioner for Human Rights, where they discussed the latest developments with the Rohingya crisis. The High Commissioner conveyed her personal greetings to Prime Minister Sheikh Hasina, and congratulated Bangladesh on her re-election to the Human Rights Council (HRC). She assured of continued engagement of her Office in realizing the newly elected government's commitments to promoting the rule of law, good governance and human rights. The State Minister said that in course of its efforts to further consolidate democracy and sustainable development, the government of Bangladesh would make all possible efforts to deliver on the huge mandate given by the electorate. High Commissioner Bachelet welcomed Bangladesh's positive consideration of developing an Action Plan for implementing the recommendations from its 3rd cycle Universal Periodic Review in HRC last year. The State Minister for Foreign Affairs earlier had a meeting with Houlin Zhao, Secretary General of the International Telecommunication Union (ITU). The Secretary General congratulated Prime Minister Sheikh Hasina on her re-election, and recalled his previous visits to Dhaka to witness the progress with "Digital Bangladesh". He expressed his wish to visit places outside the capital next time to experience the real impact of the government's broad-based digitization efforts.